Since the new ink I bought this week is so different from any ink I've used before, I figure I should make sure it can work for what I need while I still have time to find an alternate if needed. No time to get to the Studio today, but I generally get to school well before class begins, and we have nice big tables there. So today's testing was on location. Brought the new ink and a brayer, my portable palette, soap, and the old collograph plates I have from my Intro class, recently used to show the idea to the current students. Once I had the students working on the night's project, I was able to spend a few minutes pulling a new proof from my plate. Doesn't look exactly like the first proof from several years ago, but this process is not as reliable as a carved black of wood. What I was looking for was whether the textures of the collaged materials would be reproduced, and it was. Above you see the plate and the new proof. So I'll order another jar this week as I'm ordering other needed materials, just in case my current ink supply isn't quite enough for this project. As a printmaker, materials are a big part of what I do. Have to know what they are, how to work with them, where I can get them, etc. For much of my time cutting wood everything was the same, but in recent years decisions have been made, not by artists but by manufacturers and distributors, and each time this happens I have to rethink everything I knew and come up with an alternate plan. 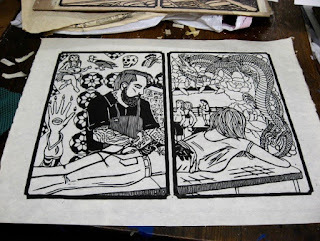 For example, for decades I had used 1/4" lauan plywood in my woodcuts, which could be purchased at pretty much any place that sells lumber. I don't know who actually makes it, but a few years ago what was available in local stores went way downhill. Issues with both the surface and the core layer (sometimes with big staples in it, which is the kind of thing you notice when you are carving through the layers), so I checked some possibilities and decided to switch to using 1/2" birch plywood as my standard. Slightly more expensive but not unreasonable, and widely available. So far, so good. Made it my recommendation for my college students, used it in the Belmar classes, and all new prints of the past few years. Had a brief temporary run as a print professor a few years ago, which caused me to start assembling information about ink and paper for students who might need it. At that point I learned that the specific relief ink that I had been using since grad school was now discontinued. The company claimed it was part of their decision to go back to their roots as paint manufacturers, but the company was founded by printmakers for the specific purpose of making printing ink, something they mentioned in their catalogs and was still being posted on their website even as they were making the changes. Very quickly I had to investigate ink possibilities, both for my work and for classes I teach, and again I found other options. Adding another problem was the collapse of the Pearl Paint chain. Their 5 floor building on Canal Street was legendary, but for purchasing I used to go to the branch in Paramus (which moved a few times) and then when I moved down the shore to the large store in Woodbridge. Not super close, but a reasonable diversion on my school commute, and a manageable distance if I couldn't wait for a time in the area. Very good selection of paper, and a lot of general supplies, discount prices on everything, but they had some financial difficulties and the chain went bankrupt. Nothing has shown up to take its place. This semester I was given two sections of a class I hadn't had or several years, foundations level, non-majors. 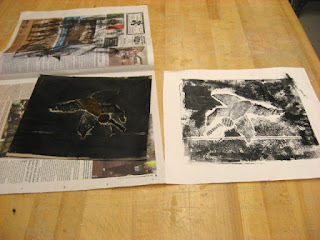 I always include a print project, and for this class I developed a simple collograph project. Still had enough of the materials to get them going and last week we made the plates in class. In two weeks we will print those plates. They will use paper from their pad, and I have plenty of printing tools, but ink is a question. Eventually I found the supply of what I typically use in this assignment (water soluble) but may not be enough to print 30 students worth of work. And the demise of a few of my previous sources means I can't go to those places to buy more. Time for more research. So yesterday I took a ride to the only relatively comprehensive art supply store in the area to see what they had. My preference for this project is a water based ink, something that can be cleaned easily and will dry quickly, but not much of it in that store. So I decided to try something new. The store did have a large supply of Akua Intaglio ink, which seems to be some kind of hybrid. Very common in current catalogs and websites, made with water and soy oils, and they say cleans with soap and water. Careful study of the label shows that it is made by Speedball, manufacturer of the water based relief ink that was mostly not there. So I decided to buy a jar to test out. If I like the results, I can easily order more from my other ink sources. And today was testing day. Went up to the Studio in the afternoon, bringing the new ink with me. Although it's called "intaglio" ink, the stuff is billed as for relief printing, too, which is how this collograph project will be printed. My test block was an old one from my Birds and Seeds series that I had there in the Studio. First thing I found was that the ink was a thick liquid, not the typical consistency of relief ink. But I continued on. 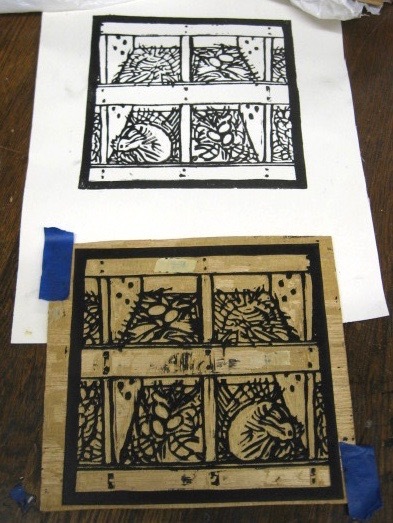 The inked block and resulting prints are shown above. The quality of the proof is not quite to the level of traditional oil relief inks, but it clearly produced a readable proof. And the print was dry within hours, which is good. The old water soluble relief ink tended to dissolve in water for easy clean up, but when this one says clean up in soap and water, they really mean you need that soap. Had enough for today, but I'll need to get more before next week's class. 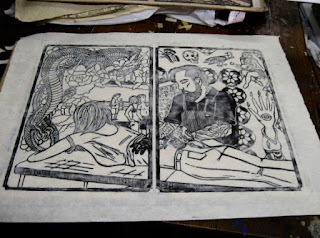 And before I do anything else, I'd like to do another test, try this ink on one of the old collograph plates that I have, and see the results. If that works, I'll get another jar to back up this one. The first weekend of the 2017 NCAA Basketball Tournament is done, and so am I. I didn't start from a great position this year, with only 3 teams in my field, but they are all gone now. The very low seeded FGCU wasn't expected to get far, but many assumed Villanova and Northwestern would do better. On my bracket I had both FGCU and Northwestern done by now, but had predicted better things for Villanova. Well, I guess this frees up more time for me. There should still be some excellent games to come, and if I'm home I'll probably watch some of them, but the ones I cared about most aren't going to happen. 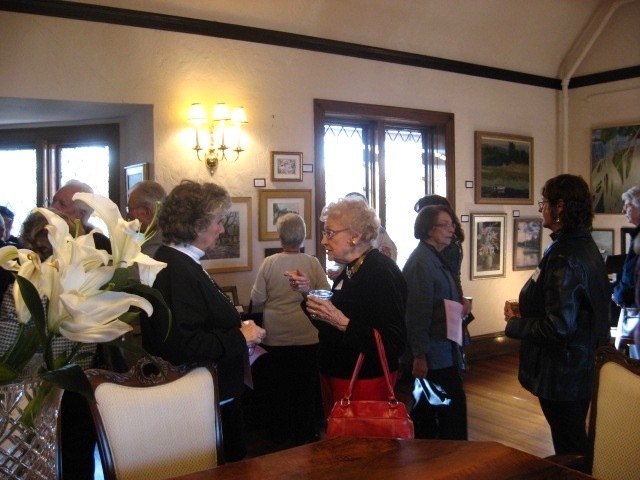 Today was the opening reception for Open Show 2017 at the Upper Gallery, the space upstairs in the Spring Lake Community House. This follows right on the heels of the one held in this same space starting late last year and ending last week. That show had been organized by the Belmar Arts Council, while this one has no official connection, though a lot of the same people are involved. The artist list for the show includes 64 names, and the rule was one piece per person. Like the previous show, it's hung salon style more or less. 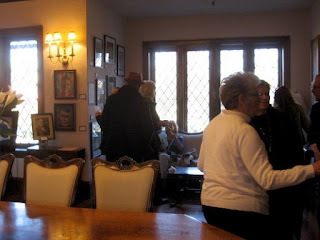 Mostly paintings, but also some sculpture, drawings, mixed media, ceramics, and the other typical art from non-specific shows. About a quarter of the names on the artist list are ones I recognize, and while not every one of them was there today (I'd recognize the faces), we still had a big crowd. I'm told that it wasn't quite as large as the attendance at the previous opening/reception in this space, but it was still pretty impressive. Didn't take long to find my piece, as it was displayed in a tabletop easel on a table right by the door leading into the gallery. That "best" certificate next to my piece is not an award for me, but for the space as one of the best galleries in their readers poll. Of course, if a viewer thinks I won an award, that doesn't hurt me. 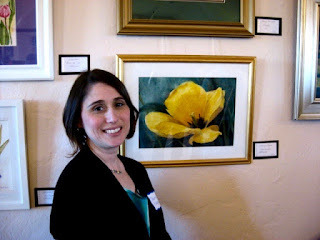 Among the people in attendance who I knew was my new pizza eating friend Jeanine, here next to a watercolor she contributed. She also has a piece in the next Belmar show, so I guess I'll be seeing her again in about 2 weeks. 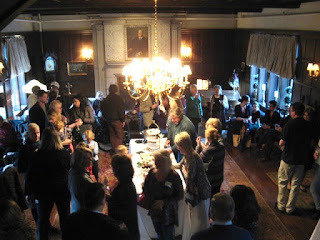 About half way through the event we decided to head downstairs to the "Brown Room" (as they call it) for the reception. 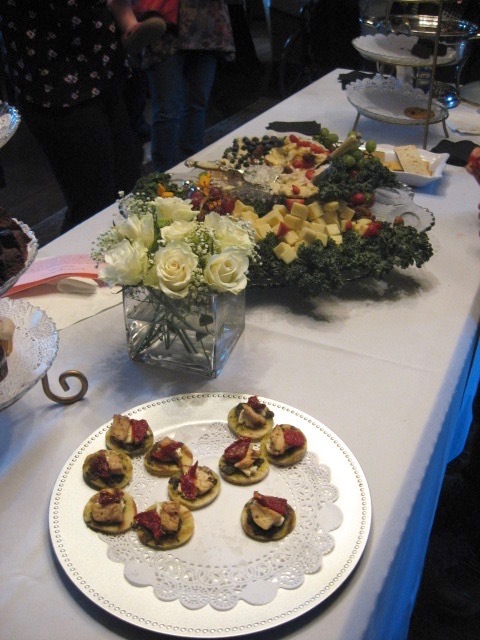 It is their policy to keep distance between the art and food. 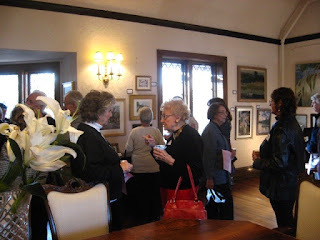 Before long, the crowd was even bigger at the reception than the gallery. I had only been in this particular room once before- when Jeanine brought us here back in December to see her contribution to that show, we found we couldn't get in the theater door, and the library door was locked, even though we expected it to be open. However a few steps away was a double door that was closed, but I found it unlocked, so I opened it and we went in, passed through this room, then found our way up the stairs to the gallery. It's a nice room, with a fire burning in the hearth at the far end of the room. Didn't need the heat on this relatively warm winter day, but it did contribute a smoky aroma to the whole building. Not a place to get a whole meal, but there were a variety of beverages and things to snack on. No problem because I had more food waiting for me at home. 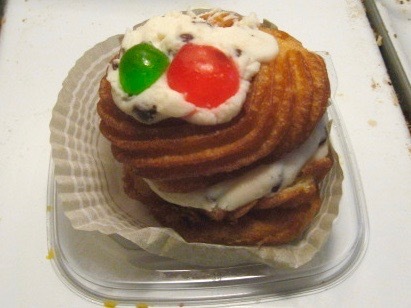 Let's not forget today is St Joseph's Day, which we always celebrate here at Studio Arrabbiata. The traditional treat is a zeppole filled with cannoli cream. Last year I got one in an Italian store up on Main Street in Belmar, but when I drove past yesterday on other business in town, I noticed the windows were covered with brown paper- never a good sign. Luckily my parents decided to go to our local big time Italian store late yesterday for some of their own, and picked one up for me, too. I look forward to enjoying it tonight. The Open Show will remain on display through July 31, 2017. The building has always declined to provide a list of open hours, just saying that it's open when something is going on in the building and there's often something going on. So if you want to see the show, stop by if you're in the area, and if you can find an open door, come on in and check it out. Must be spring show season. 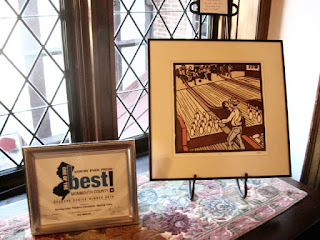 I have a piece in a group show opening in Spring Lake tomorrow, and today I dropped off my piece for the annual Belmar Art Council Juried Art Show. I joined the organization in time to enter the 2nd Annual show, which back then was the only one they had. By the 3rd Annual show we had moved into the Boatworks, and while the show has undergone a few changes since then, nothing so big as the evolution of the early years. I have been accepted into every one since that first one I was a part of. This is not guaranteed- for this year 182 entries were submitted, with 84 being accepted. Over the past year most of the works I have shown there were not completely new. In some cases I could adapt an older work (there are few themes for shows that are not covered by something in my Fourth of July series, and coloring or collage can make them into something no one has seen before), but for the JAS this year I wanted to produce something completely new. 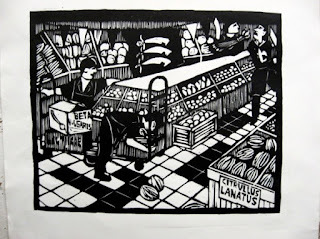 The print shown above has been seen on this blog quite a few times (under the title "supermarket battle" if you want to know the story), but this will be the first time on a wall and in a frame. It's the latest in my ongoing supermarket series (est 1998), and while I started the block last summer, it took until last month to finally get to the completed image and make a proper proof. The Belmar show was an incentive. I have some possible ideas for future prints in this series, so #25 may start up before long. The gallery at BelmarArts officially re-opens on Wednesday, but they can't promise that the installation will be complete that day. The official reception will be on April 1, 2017 from 5 to 7 pm. They have discontinued the custom of offering exhibitions as prizes, but we're told there will be cash, which is always welcome. It is my custom every year to track which colleges in the annual NCAA Men's Basketball Tournament also happen to be colleges I have a connection with. 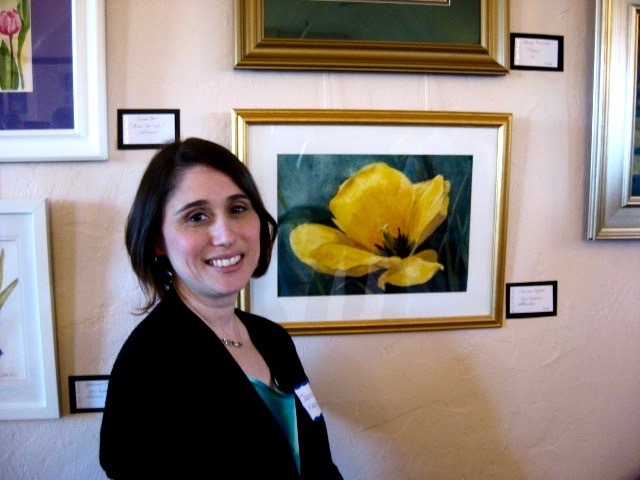 I have attended 3 colleges, currently work at 2, have been purchased by a few, and exhibited in galleries operated by many. These schools are all eligible. There are also many schools across the country where friends of mine have gone, places I visited, but I don't count these for the tournament, though they may be a rooting interest. The current format puts 68 colleges in the basketball tournament each year, and there's always at least a little overlap with my list. Can be anywhere from a few to several. I thought I might have more this year than I ended up with. For the past month, sources assumed that University of South Dakota would get the automatic bid of a conference it joined a few years ago, with a dominant record, and I've had work there, but then it got upset in the conference tournament by a school I have no connection with. Syracuse was on a lot of short lists, but didn't make the cut. When all was said and done, I claimed three connections to the dance this year. The one that's likely to go furthest is Villanova, a #1 in the east, maybe the whole bracket. Seen them play a few times this year and they live up to the hype, in fact probably exceed it, as most of the national fans will not respect any teams from the northeast. Had two prints in a show there years ago. Coming out of the west with a #8 seed is Northwestern, getting a lot of attention by getting it's first ever invite to the tournament. 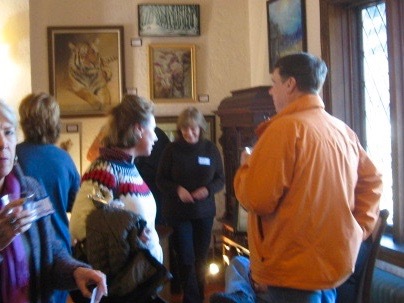 (one of my alma maters has been around for more than 300 years and still hasn't made the tournament, but they never care about that) I had a piece in a juried show there in 1985, while I was still attending school in the state, some 320 miles to the south. The last one is a bit of a stretch, but I'm allowing it. A former co-worker of mine left New Jersey and moved to Florida, and while there decided to go back to school and study art. For several years she regularly e-mailed me, sending me images and asking opinions. I've never officially taught an online class, but based on the number of such interactions, I feel kind of like I did. That school she was at was Florida Gulf Coast University, which most people only heard of because they had a run in the tournament a few years ago. They are a #14 seed in the west this year and not expected to get out of the first round, but several year ago they upset two rounds of teams, so who knows? I'll keep an eye on things and leave an update after each weekend ends, or when my last team is eliminated. Tonight was critique night, and as is my custom, I went in a few hours early to get some work done. One of my current projects is printing the two boardwalk prints that my friend Jenny wishes to purchase. One of them includes a special thing that has to be fixed- a word that has to be brought in from another source. Back when I did the original block, I had misspelled "zeppole", and not realized it until I was ready to proof if for the first time. Noticing obvious spelling errors is not quite as easy when all the letters are backwards, and some how it got past me. 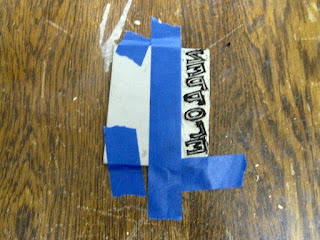 Once cut, too late to make changes, so I ended up removing all the letters from the block, carving the word correctly in a small piece of linoleum, and using that to insert the word into the print. Last week I had pulled a proof of the main print, and the next step came tonight. 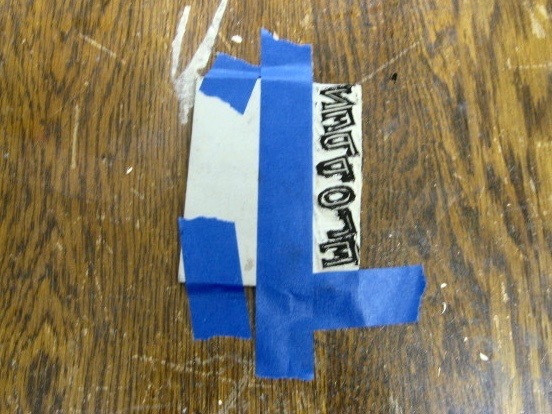 Took out the piece of linoleum with the correct spelling and taped it to my work table. Inked up the word. 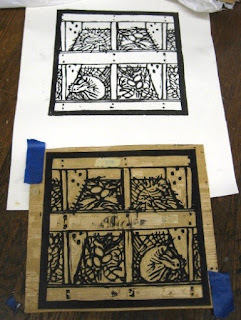 Last week's proof (above) was then place on top of the inked linoleum block, and then rubbed to print the word. Below we see the results. Once again I left it there to dry, and it should have a few days to do so, as we are expecting the biggest snow of the year to arrive tonight and I don't expect to be back there too soon. As for the critique, only one other person showed up and she didn't have anything to show, but she was happy to see my newest supermarket print. I guess I can show it again next time, whenever that is. On my schedule for today was going to Spring Lake to pick up my piece from the art show I have been a part of since late last year, one organized through BelmarArts. A new show will be replacing it, which I learned of through a notice in the local paper. I contacted the organizer, sent an image of a piece I had available, and was told they'd be happy to have me in the show. The original plan was to pick up the saint that I had in the previous show today, and the drop off day for the next one was to be on Sunday. Then we got an e-mail a few days ago saying that the drop off would be either Wednesday or Thursday of this week. No problem, as the piece was done more than a decade ago and is already framed, but it occurred to me it would be easier if they let us drop off the next one on the same day we pick up the previous piece, and the talk of a major snow storm occupying the state for a few days this week gives another incentive. So this morning I brought the piece for the next show with me, leaving it in my car ready to go when I arrived to pick up the previous piece. 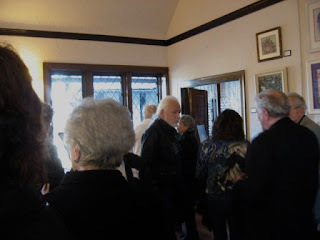 It turned out that other artists had the same instinct and new pieces were coming in the door, and with the organizer agreeable, I went back out, taking my old one to the car and bringing back the new one. The piece going into the next show (above) is Tenpins the Old Fashioned Way, a print produced originally for a "ten" themed show in South Orange in 2004. 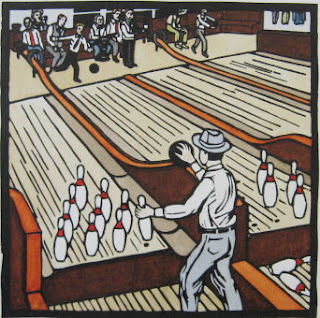 When told that the work must have a "ten" theme, my first thought was of the ten pins of a bowling alley, and the idea would be better served if we put the pins in the foreground. I thought the most practical approach would be a more old fashioned set up, back when people had to reset the pins between frames, before the massive pin setting machines were invented and installed. 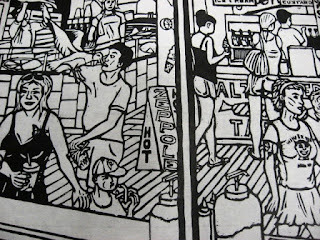 The figures in the distant background are based on an actual photograph I had, from an old Manasquan bowling alley. (the photographer's information was stamped on the back- phone numbers in those days had only 3 digits) My pin boy and alley set up are made up, based on guesses and descriptions I ran across. When I dropped it off this morning the organizer mentioned that some grandkids were fascinated by the piece and the concept of people resetting the pins, a system that predates my experience, but that's the way it was. Anyway, it's a good print, has appeared in other shows, even won an award a few years ago, and since it was in a frame already, seemed a good choice for this show. We have had near summer like weather the past few days, so naturally we are told to expect snow tomorrow. Nothing major- just a few inches. But it will show up very early in the morning and continue off and on much of the day, leading to potential driving issues tomorrow. So I figured in advance of the snow, I should get to the Studio and continue my boardwalk reprinting effort. 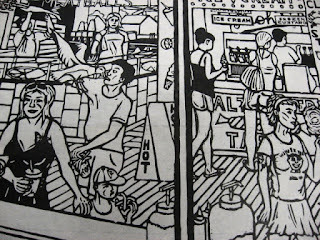 Yesterday I got an e-mail from Jenny confirming I had the correct list of pieces she wanted, and having printed one of them on my last visit, today it was time to move on to the boardwalk food image. As with the last one, I took a few minutes to clear things that could result in stray marks, as well as remove old masking tape from the last time I printed it. Then inked it, and printed it. From start to finish, about an hour and a half. The above photo shows the two proofs so far. Color has yet to come, but there will be one other step on this most recent proof. On that lower print, just to the left of the center line that separates the two halves of the diptych, there's a sign with a blank space. This goes back to a problem I had in 2009, when I left out a letter in my "ZEPPOLE" sign, not realizing until after it was cut. After debating a number of options, I decided the best approach was to cut the whole word out, cut the letters into a small piece of linoleum, and print that into the blank space later, which I did. And I will again for this proof, but I will wait until the ink is more dry, and less likely to get messed up in the process. So I hung the new proof up to dry. In a few days I can print the last piece, and a few days after that, I can begin the coloring process. Having done it once before, I just need to match the colors I have already and start filling the blanks. On spring break from one of my colleges this week, and I'm all caught up on deadlines for various area art shows, so time to do something else. Back in December I had some college friends come visit me and check out a group show I am a part of, and one of those people wanted to buy a few pieces. However, I rarely pull proofs until I actually need them, and I don't have many copies of the boardwalk prints beyond the ones that are in frames. 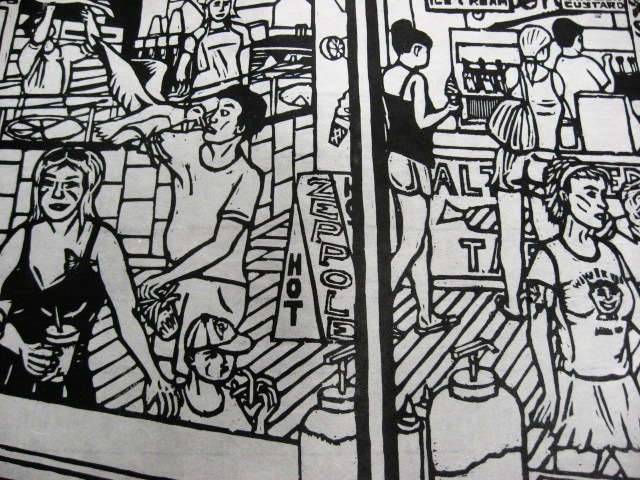 Therefore, to sell a boardwalk print, I have to produce a fresh copy. My friend Jenny, who purchased a boardwalk print about a year ago, was impressed enough by what she saw in the Studio and in the December show, to request two more. Today seemed a good day to get started on that. 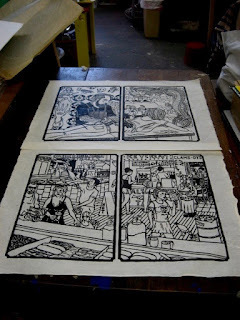 In the afternoon I drove up to Ocean Grove (my part untouched by fire), pulled out a block I need, used some gouges to clean up some bits that could lead to some stray marks, then inked and printed. For this series I have been using okawara, and for ink I went with the Portand Intense Black that I recently used for the latest supermarket print. Above is the rubbed proof still on the block, while below is the finished printed proof. Hung the new print to dry there in the Studio. In a few days I'll go back and print the other one that she requested. I'll probably start the coloring process next week. Since I still have a master copy to work from, it should be easy enough to figure out and get done. Yesterday morning I was up before the sun, as my work schedule requires, and put on the local news to get a traffic and weather report. Earlier predictions of possible snow seemed to have changed. The big news, taking up most the time for the next hour, was about a large fire in Ocean Grove. The town was built long ago and is known for its old fashioned houses. Much of the town is still technically owned by a church, and just a few decades ago, locked gates would keep cars from entering the town every Sunday. It's still very scenic, but probably not an easy place to live. The houses are mostly old, very crowded together, often just a few feet between them, with not much yard, often no driveways. Streets are narrow, and when the summer crowds arrive, very difficult to drive. Almost no parking is available- I always advise visitors to come off season. And like so many Jersey shore towns along the coast, the wind never stops blowing. Because of all this, whenever a fire breaks out in Ocean Grove, it quickly spreads. Predawn the tv showed massive fireballs. As daylight appeared, large clouds of smoke filled the skies. Took out a couple of houses and spread to a large condo complex (converted hotel, all made of wood). This was in a part of town right by the lake that separates Ocean Grove from Asbury Park, and much water from that lake was drawn to help fight the fires. Other side of town from where the Studio is, so that wasn't in danger, and it never made it to the nearby Carousel House or Casino building on the Asbury side. Good news- no deaths or major injuries, through the news reported that about 100 people were driven from their homes. 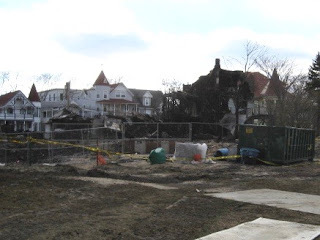 (one of the hotels is offering free temporary lodging for those displaced) I've been living in the area for about 2 decades, and I've seen quite a few fires move through Ocean Grove. But everyone is fine, the Studio is fine, no artwork damaged, life goes on.